This implementation follows Augustin P. Sarr and Philippe Elbaz–Vincent, and Jean–Claude Bajard's A Secure and Efficient Authenticated Diffie-Hellman Protocol. Note: this is FHMQV, Protocol 5, from page 11; and not FHMQV-C. Definition at line 24 of file fhmqv.h. Retrieves a reference to Crypto Parameters. Definition at line 67 of file fhmqv.h. Definition at line 78 of file fhmqv.h. Definition at line 86 of file fhmqv.h. Provides the size of ephemeral private key. Definition at line 95 of file fhmqv.h. 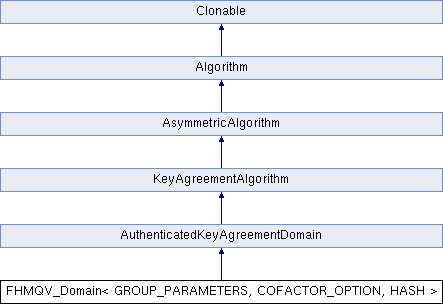 Provides the size of ephemeral public key. Definition at line 96 of file fhmqv.h. The ephemeral public key will always be validated. If you have previously validated the static public key, use validateStaticOtherPublicKey=false to save time. Definition at line 124 of file fhmqv.h.